We take a look at some of the jobs that are need to be done in the garden in June. The June gardening jobs jobs have been split into three main sections. Plants; Greenhouse; and Common maintenance tasks. It is a good time of year to sow the following vegetable seeds directly into the garden: Beetroot; Calabrase; Chicory; Courgettes; Endives; French Bean; Kohl; Marrow; Lettuce; Pak Choi; Rabi; Radish; Runner Bean; Swede; Turnip. Sow out biennials for next year eg. Eryngium; Iceland Poppies; and Wallflowers. 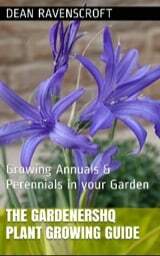 June is also a great time of year for sowing out perennial seeds. It is an ideal time to take cuttings from the following plants: Coleus; Fuchsias; Marguerites; Perlargonium; Verbena; and Perennial Wallflowers. Take softwood cuttings of the following shrubs towards the end of the month: Azalea; Boxwood; Spirea. Pinch out the shoots of Lavender, Rosemary and similar plants. Harvest Lavender flowers on a dry morning, cut off long stems, and hang upside down in a dark and warm room to dry. This should take about a month. Harvest fruits such as Redcurrents, Strawberries, Gooseberries and Cherries. Lilies will be rapidly gaining height, support them by tying their stems to canes. Time to divide Arabis; Aubrietia; Doronicum Daisies; and Primula. Prune Cypress, Privet, Lonicera and Pyrachantha hedges. Prune fast growing trees such as Juniper and Yew. Prune Deutzia, Forsythia, Viburnum and weigela florida foliis purpureis once they have finished flowering. Time to prune the Weigela! Photograph by Leonora Enking. 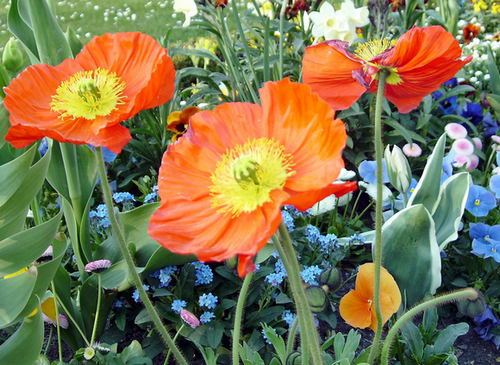 If you are growing Ornamental Poppies then cut back faded flowers and leaves to encourage further growth. Cover Strawberries with netting to keep birds and other animals away from the fruit. Grow Aubergines and Peppers in grow bags in a sunny part of the garden. At this time of year aphids are common, be on the look out for them and control with a soap based insecticide. Have a look around the garden, many plants will be thriving at this time of year and it is a good idea to thin out plants that need a little more space. 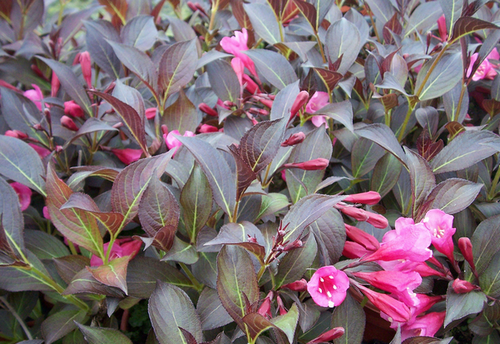 Apply fertilizer to damaged shrubs to encourage growth. Fertilize Roses monthly throughout the summer. Water plants regularly during prolonged dry periods. Give plenty of water to plants coming into fruit such as Currants, Gooseberries, Raspberries, and Strawberries. Any recently planted shrubs should be soaked weekly, make sure to give them lots of water, you can also apply mulch to conserve water. Tidy up climbing plants by pruning to make them look more attractive. Train climbing roses. Deadhead annuals to encourage further blossoms. Thin Plums and Pears and lightly trim Apples. Control weeds by using a hoe or trowel. Hand weed to avoid damage to vegetables such as Onions. Protect plants from lawnmower damage by putting up stakes and guards. Be on the lookout for mildew especially on ornamentals such as Acanthus, Bergamot, Roses etc. Regular mowing of the lawn is required (ideally twice a week). Trim the edges of the lawn. Add a mulch to the base of plants such as Sweet Pea to protect them from drying out. Plant out garden center bought bedding plants. It is a good time of year to sow the seeds of Basil, Parsley and similar herbs into pots and grow them in the windowsill. Plants growing in the greenhouse will require plenty of water at this time of year so keep an eye on them. If using grow bags apply a liquid fertilizer weekly. Cucumber and Tomato plants can now be trained with cane supports.